A few weeks ago I watched a deer run across the hay field beside my house. She stopped at the edge of the field and just stood there. After a few seconds, her spotted fawn emerged from the bushes. 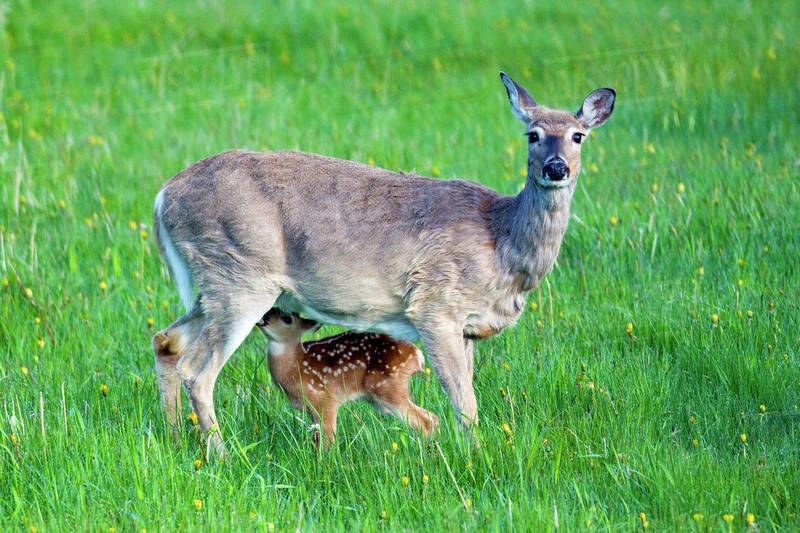 It was meal time for the young deer, and he enthusiastically began to nurse. You could tell that the fawn had been craving milk and that he was glad to have his thirst satisfied. The Bible says that we must crave spiritual milk if we are to grow in our salvation. Without the nourishment of Scripture, there is no way that we can grow into the person God wants us to become. Don’t just read the Bible; study it. Memorize key verses and meditate on them. Listen intently to what God is telling you. Then obey him. Then you will grow in your faith. “Like newborn babies, crave pure spiritual milk, so that by it you may grow up in your salvation, now that you have tasted that the Lord is good.”—1 Peter 2:2-3. This entry was posted in Christian Living, Leadership and tagged 1 Peter 2:2-3, Bible study, craving spiritual milk, fawn nursing, grow in your salvation, illustration, spiritual growth, taste that the Lord is good. Bookmark the permalink.